Founded by Pat Parsi and Danielle Rouso in 2004, Billy Jealousy has quickly become a big player when it comes to men’s grooming products, believing that men need quality skincare products just as much as women. Popular globally, consumers are initially drawn to the brand's hip irreverence and effortlessness, but they keep coming back for the effectiveness of the formulas. Not only that, but Billy Jealousy gives back. For every product sold, a donation is made to an organization that promotes the arts, the environment, or human needs. Billy Jealousy has one main principle: to encourage you to seek out products to maintain whatever look and style you're going for on a given day--suave, confident, adventurous or exotic--rest assured that you're also helping your skin stay healthy in the face of physiological and environmental stressors. Although the brand encourages an adventurous spirit, it also takes the job of nourishing and caring for skin very seriously, and their award-winning formulations are chock full of premium ingredients for the best results. Whether it's an aftershave lotion, a moisturizer, or any of the other many products in the collection, every single one contains a potent cocktail of multiple key ingredients designed to interact with one another in perfect synchronicity. Bill Jealously gives your skin just what it needs to maintain its ideal texture, elasticity, and tone in the most effective way possible. Billy Jealousy encourages you to embrace a lifestyle that celebrates looking and feeling good through a new approach to men's grooming. While the typical guy may not like to invest a lot of time and fuss into his morning routine, he does like to look and feel his best. The Billy Jealousy collection is not only fun and simple but practical and effective. Designed to have you out the door and feeling good about yourself in little time with next to no effort, Bill Jealousy is perfect for the guy who wants to effortlessly groom and go with products that really work. 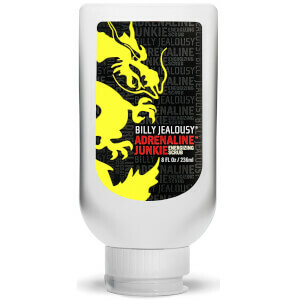 Billy Jealousy Hydroplane Super Slick Shave Cream No one wants bumps, ingrown hairs, nicks or razor drag. This award-winning and best-selling foam-free cream is both suave and efficient. Rich and deeply conditioning, it creates a silky barrier between your skin and your razor blade. Hydroplane protects against razor drag whilst natural fruit oils condition and moisturize the skin and beard to leave your face smooth and your beard soft. It is ideal for sensitive skin. Billy Jealousy Shaved Ice After Shave Balm calms irritations, restores pH balance, and hydrates skin that's just been grazed by a blade. It blocks pain and soothes the discomfort of razor burn to get comfortable, hydrated skin that’s ready for anything. Billy Jealousy Funk Buddy Deodorant No.2 Woodsy contains natural ingredients such as Witch Hazel, Sage and Bergamot extract. Funk Buddy absorbs moisture whilst inhibiting bacteria. Aloe Leaf juice will cool and soothe the skin, whilst cucumber fruit extract rejuvenates. With notes of amber, cedar wood, clove, and vanilla, take a walk in the woods with Funk Buddy for all day, great smelling freshness.